Yesterday I had a morning and evening stamp class for my local stampin' friends ... five ladies in the morning class, and 15 in the evening! I can't tell you how rewarding it is to see someone new to stamping come to their first class and fall in love with the craft just like I did several years ago! Equally rewarding is having returning friends get excited over and over again about the projects you offer! I am so blessed to know so many wonderful people through my craft, personally and through cyberspace! BASIC GRAY and SOFT SKY BIRTHDAY CARD This card was cased from Kricki's card on SCS HERE...just changed up the colors. BAROQUE MOTIFS SYMPATHY CARD This card was cased from jrek's card on SCS HERE. In the photo, it looks quite green, but it is River Rock and Chocolate Chip! Jrek embossed the medallion on her card. On mine, I just stamped the larger medallion in Chocolate Chip onto River Rock cardstock, and stamped the smaller star-like medallion in River Rock on River Rock CS - no embossing. The large swirl design is stamped in Chocolate Chip then shadowed in River Rock. Tools: 1/16” Handheld Punch, Scissors, Sponge for sponging borders with Chocolate Chip Ink. GARDEN WHIMSY CARD This card is a case of one by tayloredexpressions on SCS HERE and Heather Summers of Stamp With Heather HERE. Both created a card similar to the card on the right. I didn't have enough Groovy Guava CS for 20 cards so changed up the colors to create the one on the left with Purely Pomegranate, Old Olive & Blue Bayou. Those attending class could choose to create the color scheme of their preference. The butterfly is stamped in Blue Bayou on the Whisper White Cardstock, then stamped again on another piece of WW CS, cut out, folded in the center, and adhered with a glue dot for a 3-D look. 3 x 3 THREE FOR YOU PUNCH BOX NOTECARDS You've all probably seen these before because I posted them about a week ago (well, MOST of my projects were a surprise for those attending class yesterday!) but wanted them included in this post for easy reference for my local customers to refer to. (Hopefully, they'll go home and want to make 10 of every card they made at class! LOL!) For more information, see previous post HERE. I discovered that the Three For You Stamp Set that is part of the Three For You Punch Box (August Special) requires an extra light touch when stamping with it! You'll want to TAP your stamp to the cardstock or you'll get a bleeding-like image! 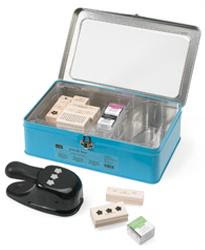 Note: The Three For You Punch Box is the Stampin’ Up! August Promotion. Purchase the Punch Box and receive 30 FREE textured note cards (10 ea. Wild Wasabi, Purely Pomegranate, and So Saffron) + envelopes! Yesterday I received this cool birthday card from Karen Laub! Isn't it just so-o-o cute?! 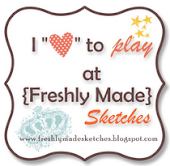 Karen (nikesmom on SCS) and Sandy Braddock (doublesmom on SCS) are both stampin' friends of mine AND fellow band moms! Karen and Sandy are in charge of marching band uniforms (among other band parent duties), and I'm one of their helpers. They are relentless in their pursuit of fitting the band kids perfectly and do an incredible job!!!! They've got my vote for vounteers of the year! Karen and Sandy came to a stamp class with me about a year ago, and were immediately hooked! What is so unique about Karen and Sandy is that they stamp together and make a great team! (something I've never been able to do ... I'm a solo stamper!). It is so fun watching them bounce ideas off of each other! They just crack me up! I really enjoy seeing their work ... they've both developed into very talented stamp artists! Can you STAND one more Altered Lunchbox Tin from me? This is the end of the road for my Lunchbox Tin Card Organizer KICK (for now)! This particular tin is very similar to the one I gave away as blog candy last week, using the CUTIE PIE DP. I'm offering this particular tin as a class next week for my local stampin' friends. Tomorrow, I have a morning and evening 5 Card Class. I'll be sharing those projects with you on Wednesday! Embellishments: Apricot Appeal, Certainly Celery and Bashful Blue Grosgrain Ribbon, On Board Blossoms, Certainly Celery Brads, Silver Brad. Tools: 1 1/4" Circle Punch (for cut-out around latch), Word Window Punch (for cut-out around handle), Round Tab Punch (for dividers), Sanding Block for Chipboard, 1 3/8", 1" & Scallop Circle Punches for center of lg. chipboard flower, Trio Flower Punch for center of small chipboard flower. Supplies: Lots and lots and lots of Sticky Strip, Stampin' Dimensionals or Foam Tape. Notes: The word "CARDS" and the words on the dividers are printed from the computer. The DP for the lid is TWO pieces to fit around the handle. It has been a CRAZY two weeks at the Riley house! I thought I'd have all this extra time when school started ... NOT! My DH and I are constant taxi cabs to and from the schools. Our days start early with our first trip to the high school for my daughter's 6:30 a.m. marching band practice. Allie's at band camp this weekend, and our season is in full swing! You'll probably be hearing alot about our OUTSTANDING Marching Band in the coming months! I'm one PROUD Band Mom! Drew (7th grade) is trying out for the Boy's Volleyball team on Monday. Oh, I so hope he makes it! He needs something right now that he can be excited about! More running for me and DH, but am so thankful Allie and Drew are active in things that interest them! Back to school time ... Open Houses, unexpected school supply shopping, and homework for ME! (I just might scream if my kids bring home one more form that needs signed, or one more thing that requires me writing a check!) I think I've had more homework than Allie and Drew have! All this activity has made me behind on many things, especially getting ready for my classes. I normally have my class projects ready one to two weeks in advance. I finally got some free time last night to prepare, and I can't WAIT to share them with you!!! I like my local friends to be surprised when they come to class, so I'll be sharing the projects with you later in the week. Another thing I've been behind on is ackowledging birthdays. My good friend, and fellow SU Demonstrator, Lorri Heiling celebrated her birthday on 8/21, and I still haven't gotten her gift to her! Visit Lorri's blog and leave her a Happy Birthday comment (it'll make her day!). This is the birthday card I made for Lorri. It was cased from mudflapmamma HERE and starofmay HERE and HERE. I found the color combination of Soft Sky, Purely Pomegranate, and Pumpkin Pie irresistable and just HAD to try it! I changed the stamp set to Big Bold Birthday, and the gifts are cut out and popped up on dimensionals. Don't you wish SU would come out with the double stitched grosgrain ribbon in ALL the 48 colors too? I love it! On Monday, I offered blog candy for a chance to win a lunchbox tin, altered with Cutie Pie DP, specially made to organize handmade greeting cards (see post HERE) in celebration of 10,000 hits. I asked readers to guess the number of buttons in a glass jar and let me know how they came across my blog. After reading 86 comments, I am completely overwhelmed with joy! Us stamping people are nice folk, aren't we?! Oh my, I felt like it was my birthday on steroids! Your kind comments are so encouraging and inspiring!!! THANK YOU !!!! Let me tell you, buttons in a jar are deceiving! I didn't even know how many buttons there were until I counted them this afternoon. While reading your guesses, I was thinking that most of you were guessing too high .... NOT! There were 601 buttons in that small little jar! Melissa, please contact me at nrileycm@cox.net. Please include your U.S. mailing address so I can mail your tin right away! Thanks to all of you who visit and/or subscribe! This has been, and will continue to be, a very fun adventure for me! Note: The petals of the flowers are curled around a pencil for dimension. Just playing around with my new Three For You Punch Box. These 3 x 3 notecards were cased by Julie at Paper Pleasing Ideas and Michelle at The Stamp Link ...just changed up some of the colors. I used the FREE textured 3 x 3 notecards that you receive this month when you purchase the Three for You Punch Box. Honestly, this wasn't something I originaly thought I needed out of the new idea book and catalog, but couldn't resist the August Promotion! Now that I have it, I'm so glad I do! The Trio Flower Punch offers so many possibilities when used with other stamp sets, and the Three For You Stamp Set is just about the cutest set I own! The Three For You Punch Box contains 1 Trio Flower Punch, 9-piece die-cut stamp set (Three For You), and 1 each Basic Black, Purely Pomegranate, and Wild Wasabi Classic Stampin' Spots. When you order this Punch Box in AUGUST, you'll receive 30 FREE textured 3 x 3 notecards in Purely Pomegranate, So Saffron, and Wild Wasabi (10 ea.) + 30 vanilla mini envelopes! It looks as though my counter will be reaching the 10,000 mark today ... woohoo! That calls for some BLOG CANDY, don't ya' think?! When starting this blog on June 18, I had no idea what to expect. I have found this adventure to be incredibly rewarding, inspiring, and another element of excitement to my craft! Thanks to all of you who read my blog, subscribe, and leave me nice comments that just MAKE MY DAY! You are truly motivating! If you've been reading my blog lately, you know I've been on an Altered Lunchbox Tin kick. (See other tins HERE and HERE). I've been saving this one just for this occasion! Yep, you can WIN this CUTIE PIE Altered Lunchbox Tin and Dividers ... specially made for organizing your handmade greeting cards! The dividers are labeled: Birthday, Thank You, Holidays, Get Well/Sympathy, Friendship, Congrats, and Misc. So how do you WIN? See this jar of buttons? It's a jar I have on a shelf in my craft room .... all my miscellaneous buttons get put in that jar -- buttons from new clothing, buttons found in the laundry -- you name it, it goes in there! It's used more for decorative purposes than anything else. Leave me a comment on THIS POST .... include your guess as to how many buttons are in the jar. I'd also love to hear how you found my blog! Was it through Splitcoast Stampers? another stamper's blog? (if so, who? ), are you a local customer of mine? Whatever it is, I'd love to hear how you found me! The button jar measures approximately 4" x 4" square and 3" tall without the lid. I will end the blog candy on Wednesday 8/22 evening. Only U.S. shipping addresses please. In the event of a tie(s), each correct number will be assigned a number in order of post and a number will be selected by random.org. GOOD LUCK !!! Notes: The word "CARDS" under the Label Holder and the words on the dividers are printed from the computer. The DP for the lid is TWO pieces to fit around the handle. 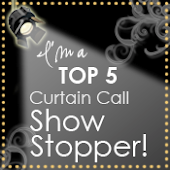 This week's SCS Featured Stamper is Melissa aka mwohlers on SCS. Check out her gallery and blog. This is Melissa's card I chose to CASE. Melissa uses this layout several times in her gallery, and I just LOVE it! I find it to be very easy to work with and appealing to the eye. Although I LOVE to stamp, I really like these cards that use the Simply Scrappin' Kits. The stickers can be used as a substitute for stamps and make for super easy and quick cards! Note: Card measures 5 ¼” x 5 ¼”. I received this suprise in my mailbox yesterday ... this beautiful handmade card from Sandra Schoenborn. 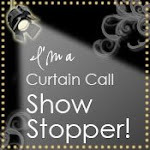 Sandra and I met recently in cyberspace ... her stampin' blog is Sandee's Corner. Be sure to visit her blog and tell her I sent you! Sandra used the Cuttlebug embossing folder to create this card (on both the Always Artichoke and Very Vanilla panels!). So pretty! THANK YOU, Sandra!!! This list was posted on SCS, and I found it to be extremely helpful ... thought you would too! 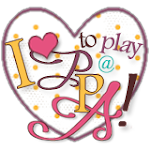 It lists Stampin' Up! punches and the stamp sets that fit those punches. I am constantly tring to figure out which punch fits which stamped image! Now, this handy guide answers that for me! I printed this list and keep it near my workspace for easy reference. Thank you to whoever created this list! I always knew Stampin' Up! 's punches were versatile, but this really shows how MANY stamp sets coordinate with the punches! DID YOU SAY .... BARGAIN?!?! Stampin' Up! just announced an exciting new promotion! 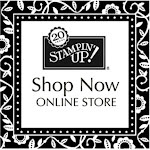 If you've ever considered becoming a Stampin' Up! Demonstrator, NOW is the ideal time to do it!!! 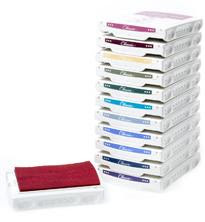 From now until September 30, you will receive a FREE color family of Classic Ink Pads (12 ink pads, a $57.95 value) with your Starter Kit purchase! Stampin' Up! offered this two years ago when I bought my starter kit .... it was just what I needed ... a deal I couldn't pass up! I started my demonstratorship as a hobbyist demo, and continued in that capacity for over a year. Now, I run it as a business teaching classes and providing customer service to my ever-growing customer base. You decide what is right for you! 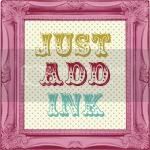 * YOU customize your Starter Kit .... YOU choose the stamp sets, YOU choose the ink pads, YOU choose the cardstock!!! * The Starter Kit has $355 worth of products for ONLY $199! * YOU get a 20% discount each time you order! * YOU get a 30% discount on your first order over $150 within the first 45 days! * YOU KEEP 20% instantly from all orders! * You earn BONUSES for sales over $400 a month! * There is NO minimum order due until Dec. 31 to remain active. * The quarterly minimum is $300 .... YOUR personal orders count toward that total! * IF you don't meet that, you keep everything, no obligation! I stayed up WAY too late last night altering two more lunchbox tins (see THIS post for previous altered tins). I'm only sharing one of them with you today because the other I'm saving for 10,000 Hits BLOG CANDY! Yep, I'm nearing 10,000 hits on my blog and will be giving away one of these Card Organizers altered with CUTIE PIE DP! Oh, it's so-o-o CUTE! So keep clicking away! This lunchbox tin is altered using CREATIVE LICENSE SIMPLY SCRAPPIN' KIT (Level One Hostess). The dividers are labeled "Birthday", "Thank You", "Holidays", "Get Well/Sympathy", "Congrats", "Friendship", and "Misc". Paper: Creative License Simply Scrappin' Kit (Level One Hostess), Pumpkin Pie and Soft Sky CS. Embellishments: Soft Sky, Wild Wasabi, and Blue Bayou Double Stitched Grosgrain Ribbon, Silver Brads. Tools: 1 1/4" Circle Punch (for cut-out around latch), Word Window Punch (for cut-out around handle), Round Tab Punch (for dividers). Notes: The word "CARDS" are letter stickers from Creative Memories. The DP for the lid is TWO pieces to fit around the handle. As I mentioned in my previous post, ALL the stamp sets in the new Holiday Mini '07 Catalog are DIE CUT! No need to trim the rubber portion! Woohoo!!!! These photos are from the new AUTUMN APPARITIONS Stamp Set. Each image is die cut ... all you need to do is pop them out and adhere them to the wood. EASY! Last Spring, my friend Paula found 20 of these tins at a garage sale for me. Kudos to Paula!!! (She's always lookin' out for me!). I would provide the measurements for altering, but they measure a little differently than the Lunchbox Tins sold at scrapbook/stamping stores. If I recall correctly, they sell at the stores for approx. $6 - $8. Paula got these for fifty cents each! Woohoo! I have been GRADUALLY altering them as Card Organizers. Very time-consuming project, but well worth it! I have several more of these Card Organizers to make.... here's the first two with hopefully more to come within the week! The two altered tins I made today use the HAPPY ME SIMPLY SCRAPPIN' BUNDLE (Level 3 Hostess). Gosh I LOVE this bundle!!!! So colorful, versatile, and FUN! (See recipe below). The two tins are very similar with slight differences. Below are the dividers for each tin. The words, "Birthday", "Thank You", "Holidays", "Get Well / Sympathy", "Friendship", "Congrats", and "Misc" were printed from the computer on Soft Sky CS and punched out with the Round Tab Punch...embellished with White Brads. Paper: Happy Me Simply Scrappin' Bundle (Level 3 Hostess), Groovy Guava, Soft Sky, and Purely Pomegranate CS. Embellishments: Purely Pomegranate, Soft Sky & Groovy Guava Double Stitched Grosgrain Ribbon, Sky Label Holder by Making Memories, White Brads (non-SU). I needed a better storage system for my ON BOARD CHIPBOARD (pg. 180-181 Fall-Winter '07) and had an extra shelf in my craft room. I wanted something to add a little color and decor to my room ... here's what I came up with .... I found these glass canisters/jars at Walmart for under $4.00 each. I used the PRINTS SERIES DESIGNER PAPERS (Rose Red, Soft Sky, Certainly Celery, Blue Bayou, and Groovy Guava) to cover the lids by cutting a 4 1/2 inch circle. I tied DOUBLE STITCHED GROSGRAIN RIBBON in the NEW IN COLORS (Purely Pomegranate, Soft Sky, Wild Wasabi, Blue Bayou, and Groovy Guava) around the neck of the jar with a bow at the top. I simply printed the name of the On Board Collection on coordinating Cardstock (from my computer/printer), punched the words out with the CIRCLE SCALLOP PUNCH, added a Silver Eyelet, and hung it from the ribbon with silver cord. These jars look so cute on my bookshelf! I would have liked to photograph them on the shelf, but the lighting for photography in my craft room just doesn't cut it! Thank goodness for birthdays and for friends who stamp, or I would have NO new posts for you! I've had NO stamping time this week...lots to do to get my kids ready for school. This beautiful pocket card was hand stamped by my friend and fellow SU Demonstrator, Lorri Heiling (Confessions of A Stamping Addict) for my daughter's 16th birthday. I love how the CS is folded over at an angle for the flap. Lorri also used chipboard (the Close To Cocoa flower), and a white gel pen to create a stitch on the button. Adorable! I have TWO RAKs to share with you today. The first card is from Kathy Wheeler, aka Kathy W on SCS, the winner of my first ever blog candy! Kathy's card came via snail mail, completely unexpected, and so very kind! She even provided the recipe for her gorgeous card! The photo doesn't do this card justice --- the butteryfly is very sparkly and glittery, and the ribbon has a pastel rainbow sheen to it. KATHY'S RECIPE: Stamps: Autumn Leaf Prints (Sentiment), Delight In Life (for the background on pink CS) Paper: Cool Caribbean, Whisper White, Pretty In Pink, Apricot Appeal, Patterned Paper, DCWV pastel mat stack, Butterfly cut from unknown DP Ink: Tempting Turquoise, Apricot Appeal, Regal Rose Embellishments: May Arts Ribbon, Sakura Glue Pen and Clear Glitter Pen, Stampin' Dimensionals, Glue Dots, Ticket Corner Punch, Word Window Punch, Dazzling Diamonds Note: All supplies are Stampin' Up! unless otherwise noted. This next card is a Sweet 16 birthday card for my daughter from my friend and neighbor, Tammy Mendoza. The inside says "16th Birthday", "we hope this year is the sweetest!". Tammy has only been stamping since February ... her natural talent just blows me away! I think this is the happiest card I've ever seen! 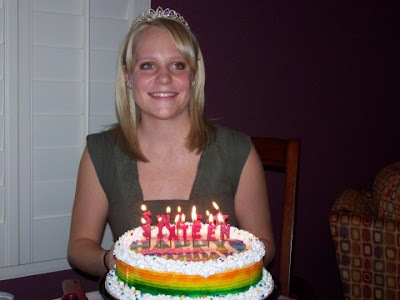 I've been MIA for a few days because I've been planning a SURPRISE party for my daughter's Sweet 16. The party was last night, and it was a complete surprise to her with the help of her friends! A very fun day! Hoping to get some stamping in this week in between getting the kiddos ready for back to school! Last week, SCS celebrated their 3rd Anniversary by offering MANY challenges. Wish I had unlimited time to attempt them all! This Tag Card was for Yvette's Tag Card Challenge on July 31. The Tag Card measures 9" x 5 1/2", and is scored at 3" and 6". The only rule was to use only one stamp set, and any sentiments used needed to be from that stamp set or handwritten. I hope I'm not bending the rules too much with this one because I used NO stamp set! All decor is from the Little Reminders No. 2 Accents & Elements. I am just in love with all the Accents & Elements ... they make for a very easy project! I'll defenitely be making more of these tag cards! They're super easy, and I love the looks of them! I made this card for a very special friend, Paula (scroll down for story below), and wanted room to write my words of thanks to her. The lined paper from Notations No. 2 DP was perfect for that! The Tag Corner Punch is how I achieved the tag look. I just HAD to share the story behind my thank you card to Paula. I met Paula through our daughters about three years ago, and we immediately hit it off (our daughters are best friends too!). One of the first things I asked her is, "what do you do?" as in "for a living?". She said she's an "ebay-er"! I, being totally computer illiterate at the time, had no clue what that was! As I've mentioned before in my blog, I sell on ebay, and get the majority of my inventory at garage sales. Where did I learn how to do this? ... Paula! I can't believe the incredible amount of time she has spent showing me how to garage sale (YES, it there is a method to the madness! ), and how to sell on ebay! For my birthday last week, not only did Paula give me some awesome shower scrub & gel, but gave me this Boyds Bears & Friends figurine in the photos below. I think this Yard Sale lady is absolutely hilarious! I display it proudly in my craft room to remind me of what a blessing Paula has been in my life. What makes this figurine even more special ..... she purchased it at a Garage Sale !!!!! LOL!!!! I just chuckle every time I look at it! Of course, no garage sale bargain is complete without a defect! Look at the Yard Sale Lady's crab on her hat --- it's missing an arm! Simply adding to the charm of Paula's gift! The words on her purse say "I BRAKE FOR YARD SALES". These signs say "SO MUCH FOR SO LITTLE" and "I JUST CAN'T SAY NO". If you only knew how many times Paula and I have called each other on a Friday or Saturday morning to share our garage sale finds and stories, you would laugh at this as hard as we have!